What is a riser and lid? Why is a riser necessary? According to Nebraska Department of Environmental Quality, TITLE 124 “There shall be one or more access manholes at least 12 inches in diameter and located within six feet of all walls of the tank. 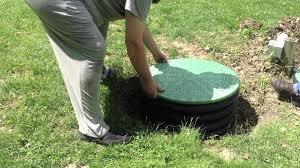 Each access manhole shall have a properly secured cover.” For a septic system to meet state code it must have a riser. A riser allows for immediate access – which may not sound necessary now when you aren’t having any problems, but when you have septic backing up into your house and you need in your tank ASAP, a riser looks pretty good! Also, many people don’t even know where there tank is located – having a riser let’s you know exactly where it is at all times! If you currently do not know where your tank is located and a problem arises, you are now faced with finding your tank and then digging it up – all the while delaying any solutions to the septic backing up into your home. A riser solves all these problems. Not only that, but a riser allows year-long access which is also nice when the ground is frozen and emergencies arise. What do Southwick risers look like? 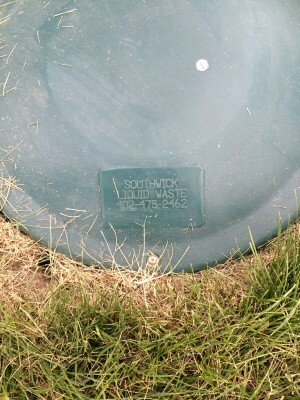 Below are a couple of pictures of risers installed by Southwick Liquid Waste. All of our risers come with a “stamp” which has our name and phone number. If you can’t remember who to call, look at your lid! 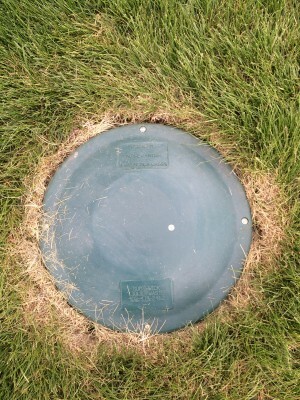 You’ll also see what the lid looks like once it is placed above the septic tank. This is installed so that you can easily mow over and it isn’t an eye sore for your yard.